Recently I rode to Valencia via high-speed train from Madrid, and what’s normally a journey of a few hours, is now completed in just under two. Trains will always be the preferred mode of transportation for me; they get you deep in thought, with your mind easily shifting from nostalgic thoughts to pondering the future. Looking out the window, the past crept in, as the landscape I was seeing before me is different from what I was used to, gone now are the green, lush rolling hills that surround Gravetye, and a new alien landscape unfolded before me. Now, there is soil that is rich in color with mountains and rocky outcrops that continually appear on the horizon, while the farmland plays out its carved patterns in the earth, it was fascinating to take in. Sorolla once said, “Nature, the sun itself, produces color effects... instantaneously.” He was right and as I continued watching, your words about light played in my mind too, especially when you said, “Light is perhaps the most misunderstood and poorly considered element in gardens. Yet it is light that noticeably alters the mood and atmosphere of the garden – the silhouettes of trees and shrubs, the long shadows cast onto the walls, and the reflections in water features. Landscapes became more sculptural, abstract, and wilder.” It was always a rule of mine that gardens should not be exclusively beautiful to look at but also full of fleeting moments, incorporating more elements than just flowers. Light, water, ground level and the shadows created are just as essential in bringing a garden or landscape to life. You have a way with writing and your words were music to my ears. Seeing the farms and fields whizzing by turned my mind to plants. It got me thinking about how Spain is a huge exporter of carnations, and exports them in large numbers to help supply the demand required by the world flower market. 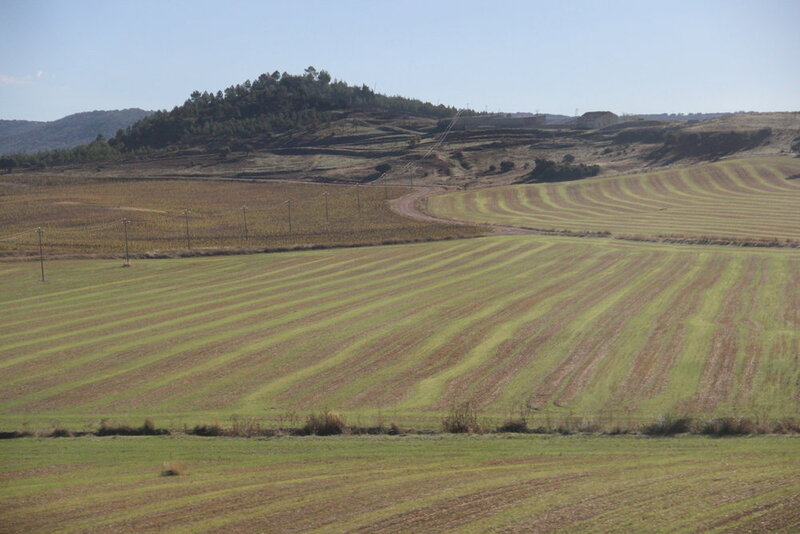 Saffron is another successful crop grown here, with majority of the harvest happening in the end of October in Toledo where they grow fields of Crocus sativus. I look forward to witnessing this next autumn. Spain is a huge producer of rice, specifically Arborio, the main ingredient of Paella, with it mostly growing in fields on the outskirts of Valencia. These thoughts of plants, coupled with living in a city again, made me miss the kitchen garden at Gravetye. Again I will not dwell, and even though I have two small terraces, I need to have a garden in soil; pots are not enough for me. Currently I am looking for an allotment to call my own and am searching to see if something like this exists in Madrid. Having a small plot to grow some food and cut flowers are high on my list so, please, keep your fingers crossed.